How do I manage staff roles? Here's how you can change a course staff member's permissions in a class. 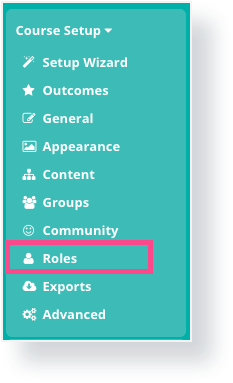 Go to Course Setup > Roles. Add people to your staff list via their OpenLearning name or profile name. Once a staff member has been added to the staff list you can then manage what the user is allowed to do within the course. Facilitates: The user will be able to access the Administer Students tools from the sidebar. These tools help teachers monitor class engagement and student progress. By checking and unchecking particular boxes, you can give each staff member any combination of these permissions. If you have multiple classes, you can specify permissions on a per class basis. Click Edit to bring up the edit classes modal. Using this modal, you can add and remove classes for this user. Type the name of an existing class into the text box and select one of the auto-completed options to add the class for this user. Close the module once finished. Refresh the page for the changes to take effect. 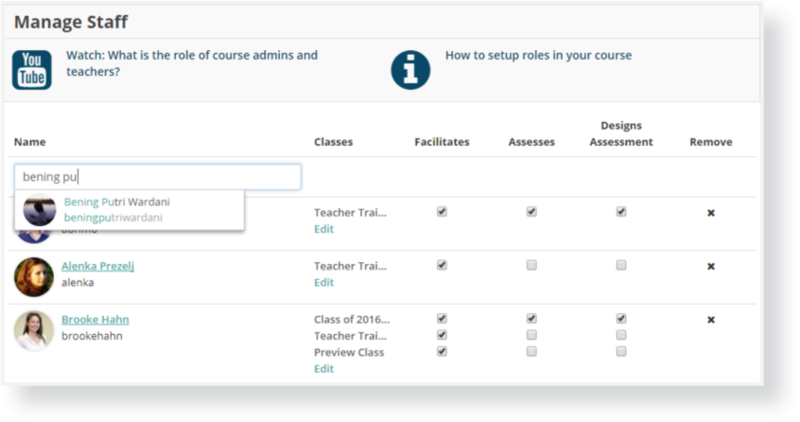 To learn about adding administrators to your course visit How do I add another admin to my course?